Pierre S. du Pont’s Longwood Gardens was once a complex that seemed like it would be more at home in the rural aristocratic lands of Europe than Pennsylvania. With a taste for ornate and opulent styles, du Pont, a Philadelphian businessman of French descent, was determined to emulate his ancestors’ grandeur. Since construction finished on Longwood in the 1930s, du Pont had one of the most dazzling and decorated fountain systems at his disposal. 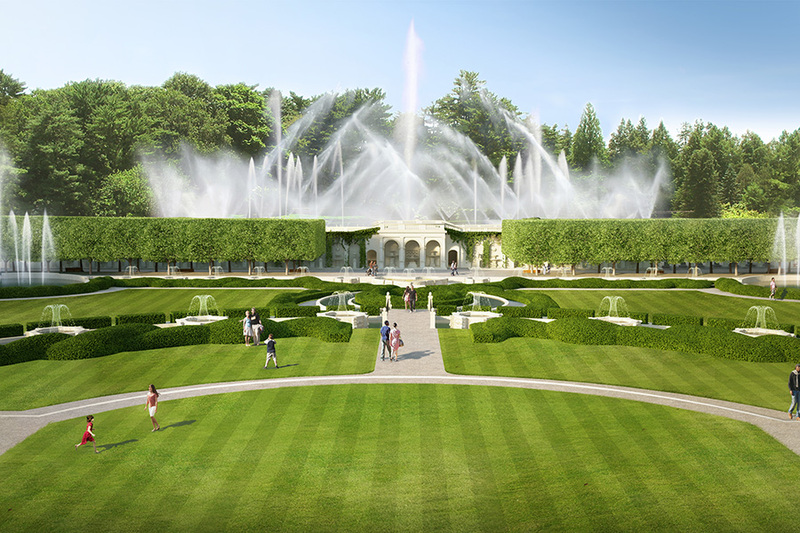 However, after 80 years of existence, the time has come to restore Longwood’s main fountain garden with a comprehensive makeover both above and below ground. A team led by Beyer Blinder Belle is taking up the task. Dan Lepore & Sons, the firm in charge of stone restoration, had the painstaking task of returning over 4,000 unique pieces back to their former glory. To complete the task, each stone element was given a barcode so it could be individually tracked with all changes and processes being logged on the way. Restoring Pierre S. du Pont’s Longwood Gardens in Kennett Square, Pennsylvania, requires more work underneath the ground than above. Kate Brown, an architectural conservator at the firm, spoke of the “shell inclusions” in the limestone that had caused it to “deteriorate in unique ways.” During the repair process, which involved extensive cleaning, the stones’ intricate detailing can finally be realized once again, while retaining their aged authenticity. At the center of the garden are allées, a French term for “driveways” and a nod to the surrounding Baroque masonry that du Pont no doubt discovered on one of his many trips to France. Here, West 8, who masterplanned the project and are in charge of landscaping, has lined the allées with Tilia cordata “PNI 6025” Greenspire little leaf linden trees. An abundant bloomer, these trees produce small fragrant flowers appearing in late June and July and are known for attracting bees. The French theme is also continued here with these trees being pollarded (a typical technique used to square off trees in France) to create a neatly sculpted aesthetic. Boxhead bushes in the middle of the gardens have been remolded too, and the new billowing, braided forms are much closer to the 1920s original design. While on the surface, the project may appear to focus on extravagant planting, fancy fountains, and blue-blooded vistas, it is below ground where the renovations really begin to make a difference. In fact, over 50 percent of the changes to be made are underground. Here, the project by numbers is impressive: 1,400 linear feet of tunneling is being installed to improve access to the system, which boasts 51 tons of electrical wiring and some 54,000 feet of pipework. Within this piping framework, geothermal wells, which average a depth of 450 feet, will utilize the Earth’s constant temperature as a cooling device; as part of a closed loop system, they will generate the power equivalent to air-conditioning units in 30 houses. In terms of the fountains themselves, 379 legacy jets will be restored with updated nozzles, plumbing, and pumps. 1,340 additional jets and streams will be powered by 68 pumps that will be able to power water 175 feet into the air, 45 feet higher than it is currently able. Three reservoirs will be used to gain better control of the system. If one goes down, the remaining two can still function, preventing complete outages. 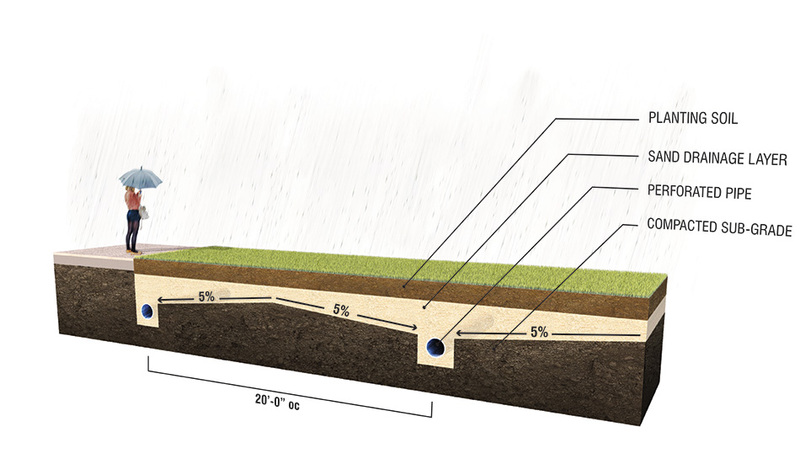 Meanwhile during winter, sections can be isolated to keep water running. A new strainer will also be in place to filter harmful debris that can damage fountain nozzles. If that wasn’t enough, state-of-the-art LED lighting will also be integrated to facilitate the production of what will be a spectacular array of synchronized light and water—with audiences hopefully being just as amazed as du Pont was back in 1893 when he marveled at the display on show at the Chicago World Columbian Exposition, the event that reportedly inspired his endeavors.